ex Oceano becomes a reality! ex Oceano is the second symphony of Australian composer, Matthew Dewey. 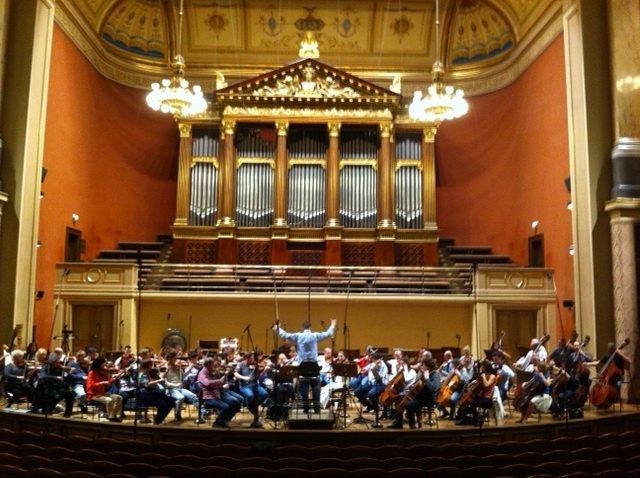 The symphony was recorded by the Czech National Symphony Orchestra in the Rudolfinum – Dvořák Hall, Prague, 24-27 September, 2013. A truly epic journey in creative ability and expressive powers took Matthew Dewey across the globe for this powerful and moving interpretation, as skilled maestro, Jan Kucera, and musicians of the CNSO, translate the notes of a musical score into a vast sonic immersion and experience – an extraordinary fusion in which compositional vision is brought to life, and ex Oceano becomes a reality. Scientist, Nick Roden – loaded with film equipment – was on hand to capture footage of this truly momentous occasion for all involved in the collaboration. We look forward to sharing some of the atmosphere and emotion of the event in due course. For now, both Matthew and Nick are heading off for some well-earned personal r’n’r in Europe.